1080 Overflow Drain - Water Dam Type - Jay R. Smith MFG Co.
Used in flat roofs of any construction where a constant height of water is desired on the roof. It may also be used as an emergency overflow for conventional roofs, draining rain water when the depth of the water on the roof reaches the water dam height. Duco Cast Iron Body, Flashing Clamp and Gravel Stop with Polyethylene Dome, and Cast Iron Water Dam. Smith No. 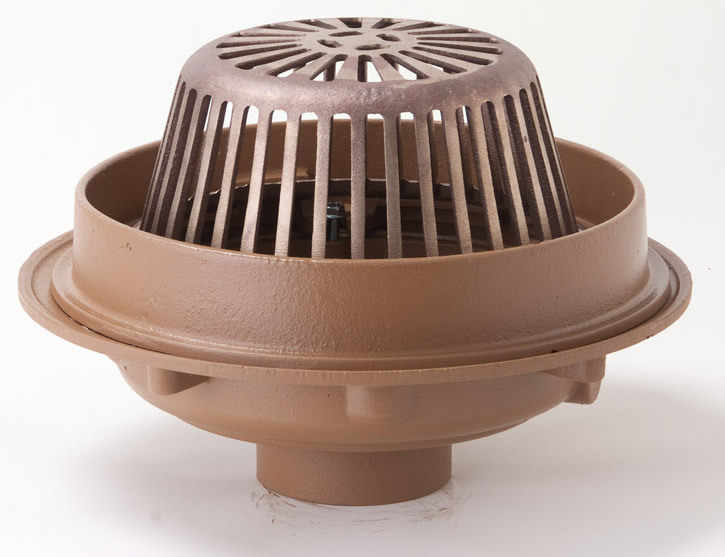 1080 cast iron body with 2” high water dam and polyethylene dome. Smith No. 1080 (-E-R-C) cast iron body with 2” high water dam extension sleeve for insulation, underdeck clamp, sump receiver and polyethylene dome. Smith No. 1080 (-R-C) cast iron body with 2” high water dam, underdeck clamp, sump receiver and polyethylene dome. See manufacturer’s catalog for recommended deck opening.